6 Series innovative engineered rotary roof heads are symmetrical with the system’s exterior wind deflectors and its gravity exhausters resulting in high performance natural air extraction with no back draughts. When wind passes at a high velocity outside, this symmetry creates a powerful suction force, whilst interior deflectors prevent the rush of air accelerating out of the ventilator from reversing. Optimal performance of the 6 series in all weather conditions has been established during rigorous scientific testing and through their successful application in sites around the world. The 6 Series roof ventilators are a heavy-duty yet environmentally-sustainable and economical natural ventilation solution suitable for industrial, commercial and community uses. They are able to be fitted on slope, ridge, flat or curved roofs offering optimum versatility to accommodate all architectural projects with strong aesthetic. Being storm-proof, water-tight and are capable of withstanding up to 2 kpa of wind pressure without external guy wire, the 6 Series ventilators provide your building with full protection from the elements, while guaranteeing a pleasing design. Engineered design, which guarantee high performance and strong aesthetic. Using nature’s forces to extract air effectively, the innovative design of the 6 Series roof ventilators will provide optimum air extraction at a coefficient of discharge of 0.36. Being low weight and highly versatile, the 6 Series vents can be easily fitted on most building structures. Weather-proof construction providing a water tight ventilation solution for any building. Environmentally sustainable with limited energy use to run and maintain. Customisable in options of Colorbond, Zincalume, galvanised steel, aluminium or stainless steel, the Airocle 6 Series roof vents provides the perfect adaptable architectural ventilation solution for the future. 6 Series roof vents require roof bases, which are precision manufacturer in 5 types to accommodate your specific roof profile. 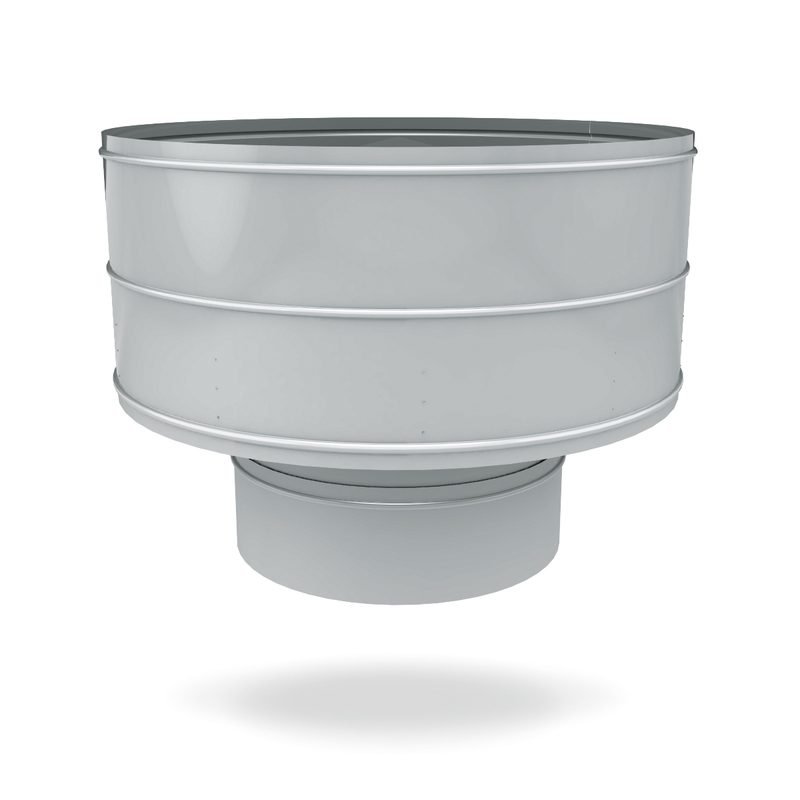 The 6 Series roof ventilators can withstand up to 2kpa of wind pressure without any additional wires. NB. For ventilators and bases 600mm diameter and over, additional support between purlins is required. Base type and roof pitch must be specified. Extension flue pipes longer than 1000 mm above the roof line must be fitted with guy wires. Disc or butterfly dampers can be installed in the duct and are optional. Dampers are counterweighted or feature spring returns for normal opening operation. Optional damper actuator equipment including electric motors/ pneumatic cylinders are available upon request. Bird screens, which keep birds and insects from entering the ventilators, whist maintaining their water tightness, are also available as an optional extra. Airocle’s ventilators use efficient design coupled with natural science. Once installed, the system operates without running or maintenance costs. This means 6 Series (previously Zephyr) gives long-term operational savings, for the building as well as the environment.